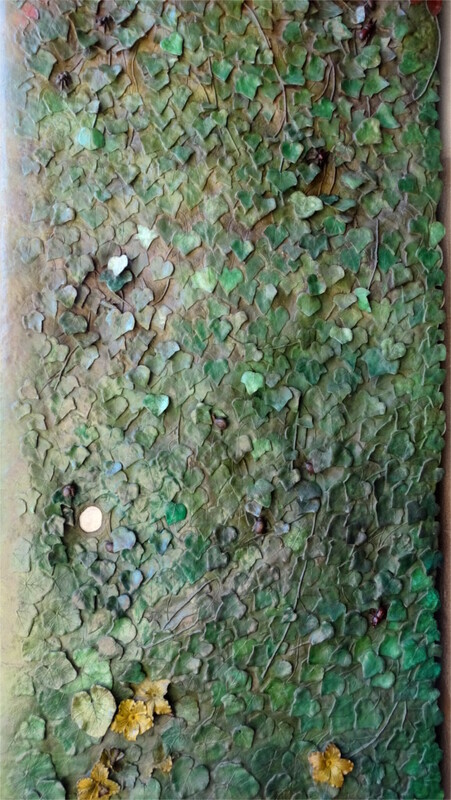 An enchanting part of Gaudi’s Sagrada Familia church in Barcelona is the beautiful door in the nativity facade. I was walking through it when I saw the beetle in the featured photo. I was drawn instantly into this magical world. The Family and I stood in front of the doors looking at the flowers and insects visible in the profusion of verdigris ridden green leaves. What a beautiful vision, and such pleasant technicalities. 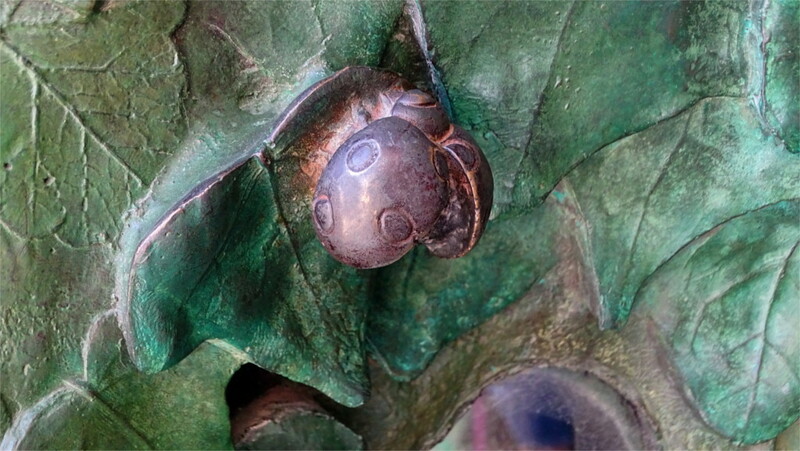 The selective oxidation of different metals is used to create a wonderfully muted polychrome. The press of crowds made it difficult to step back to take a photo of the doors. I managed to get the half that you can see in the photo above. It was designed and executed by Etsuro Sotoo, a Japanese sculptor who has spent a large part of his working life in bringing Gaudi’s vision for the church to life. Almost 900 years ago, in 1248 CE, the Moorish rule over Seville came to an end when Fernando III captured the town. His son, Alfonso X, razed a large part of the Almohad palace and built a Gothic palace in its place. Parts of the garden also re-purposed the walls of the old palace. This gallery shows parts of the Gothic palace and the garden behind it. Our first day in Madrid was long. 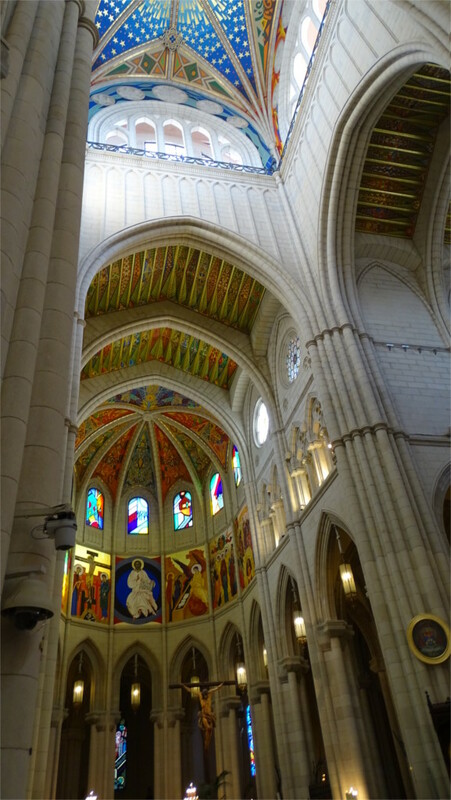 The last place we walked into was the Almudena cathedral. One set of doors was shut. As I fiddled with my camera in front of the doors, The Family made a sensible suggestion, “Do it later.” So I followed her into the cool interior. As we stood in the nave and looked up, I told The Family “Something tells me we are not in Kansas anymore.” Indeed we were not. The Gothic exterior gave way to something totally different inside: colourful, modern, and almost playful. 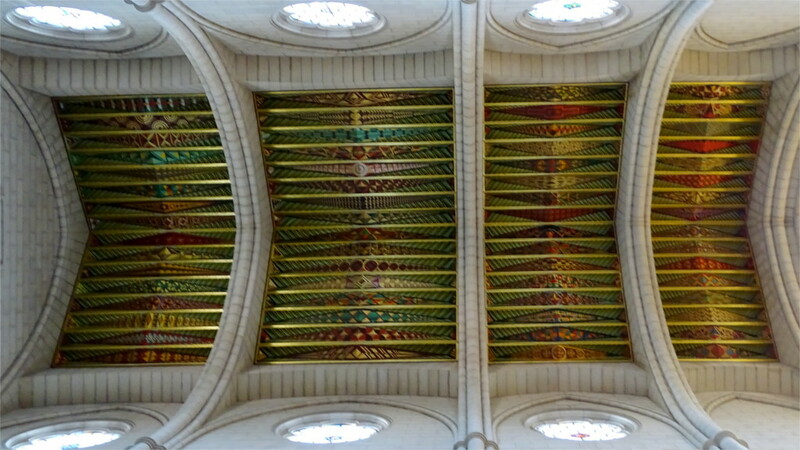 I sat down on one of the pews, and peered up at the wooden vaulting, beautifully painted. Later I would come to recognize this as typical of Mudejar architecture. Later still I would realize that this particular example was special: it was the Mudejar style adapted to the twentieth century. Wikipedia tells us that after the Spanish court moved to Madrid, the empire was so busy building cities abroad that it had no money left to build a cathedral in its capital. The main cathedral remained in Toledo. Only in the 19th century was this structure finally started. 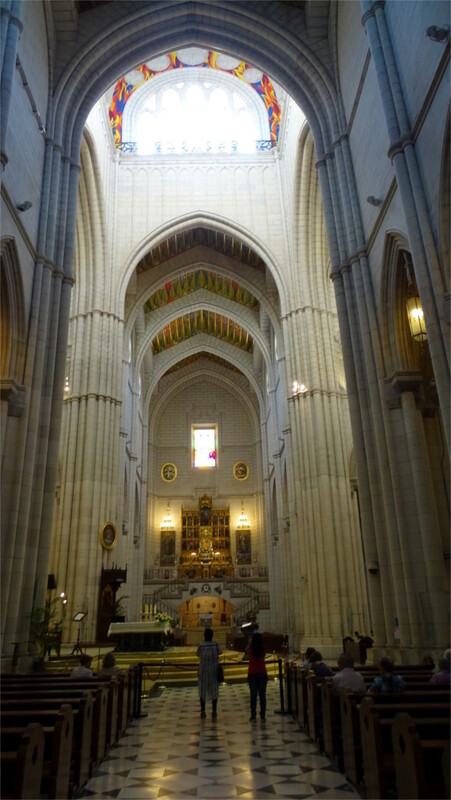 Construction continued through the 20th century, and was consecrated less than 25 years ago. We moved up an aisle towards the transept. The pews there were blocked off and people were coming in to sit. A service would begin soon. I leaned over and looked down the transept to the other end. The stained glass looked bright and modern, as did the paintings below the windows. The apse was at the western end of this church, another non-traditional touch. 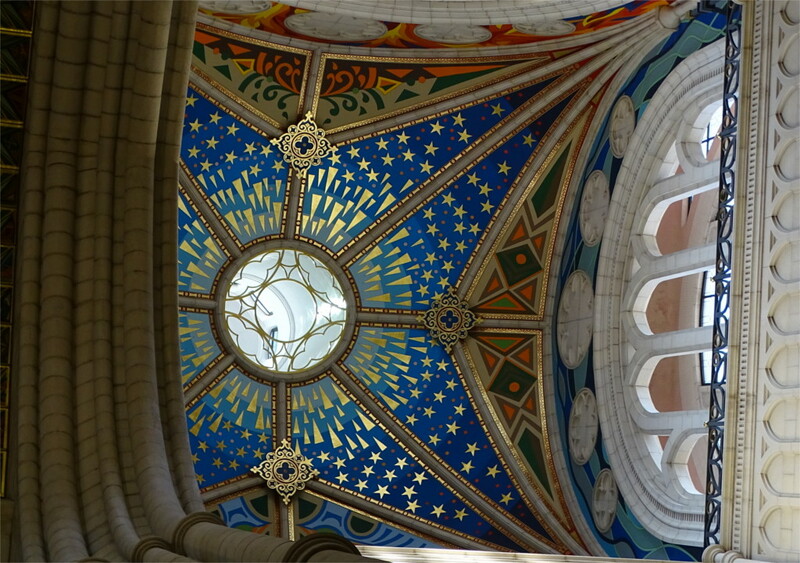 I leant in and back and twisted my arms over to take a photo of the painting on the vault in front of the apse. It was another modern piece. I wished we had come earlier, so that we could take a closer look at the paintings and the radiating chapels. Spain was going to be interesting and strange: behind its unsmiling and traditional facade it is contemporary in a idiosyncratic way. I walked back out to take a photo of the door. Mercury is a liquid metal, and you could fill bowls with it. But to see a pool of Mercury, the size of a swimming pool, glistening in the sun is a little beyond one’s imagination. “Isn’t there a danger of poisoning the water supply?” I asked when I first heard of the pool of Mercury. Can their safety inspection processes really be so dependable? The Family was having none of it. She laughed hard, and said Mercury was a god before he was a metal. The pool was not of quick silver, but of the god after all. Such a pleasant sight after all my fevered imagining. Late in the burning hot morning it was nice to stand here in the Alcazar of Seville and feel the breeze cooling as it played over the water of the pool. Entering the unfinished palace which Charles V wanted built next to the Alcazar of Alhambra, I had to consciously wipe my mind free of all the beauty I’d seen around it. Only then can you enter the vision of Pedro Machuca, the architect. The design is a simple geometric concept of the kind that the Renaissance ascribed to classical Greece: a circle inscribed into a square. Seen from above the outer walls form a square. Inside it is a circular patio. The building is two-storied. 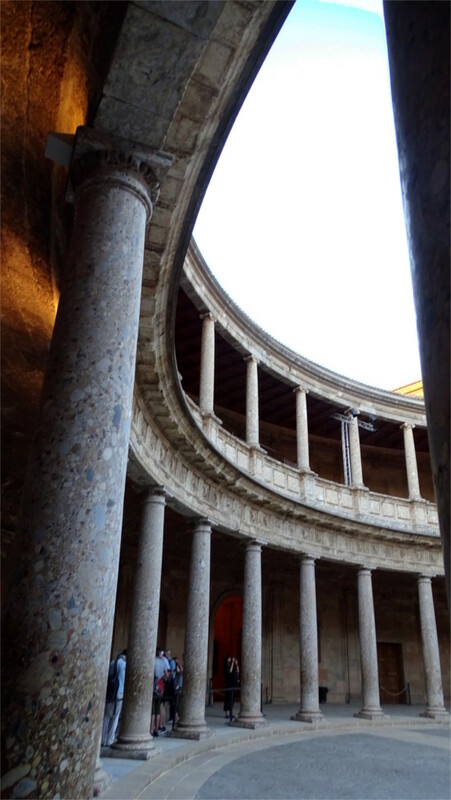 You can see in the photo above that the columns on the lower floor are Doric and the upper are Ionic. The windows on the facade mirror this: Ionian above, and Tuscan below. Unfortunately I never took a photo of the facade. It was June, and the place was full of people. Every frame looked cluttered. In retrospect, I should have taken a photo even if it wasn’t going to look perfect. 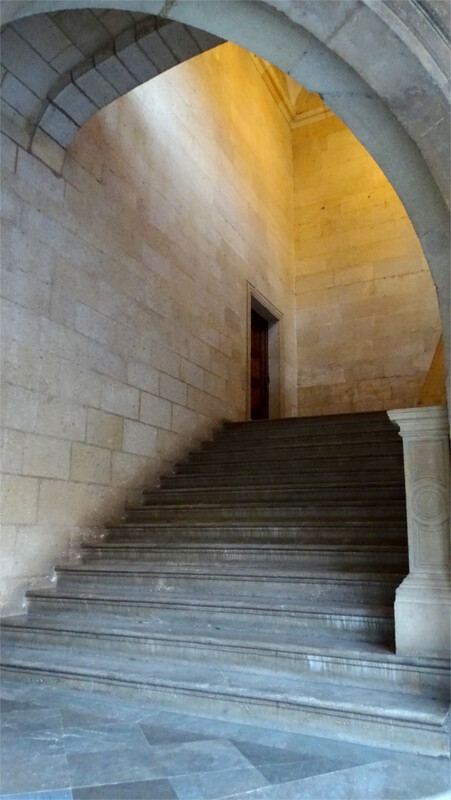 The Renaissance seems to have invented the modern staircase, with its even rise, so easy on the knees. Every bit of the structure drips with an unified sense of elementary geometry: see the photo above. Even the precision of the tiles on the floor gives you a sense of how the rediscovery of Greek geometry and measurements was transforming European design. No emperor ever lived in the palace. It never even had a roof until the middle of the 20th century. As a result decorations are sparse. The medallion you see in the featured photo adorns the otherwise severe facade. 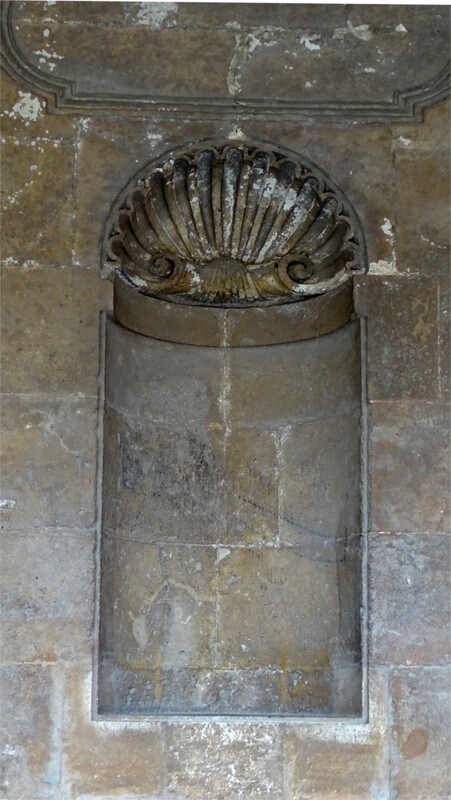 Inside there are empty niches on the wall with scallop-shell designs on them. The incomplete palace is a magnificent idea, never seen again in its contemporaries. It is as startling as it would be if the Barcelona Pavilion built by Mies van der Rohe never influenced his generation. We were very naive about access to monuments in Spain. We should have bought tickets on-line a while before our visit, instead of arriving and standing in queue. The queue moved fast, but the tour of the upper part of the palace was sold out. We were restricted (if that is the correct word) to the vast ground level of the complex. This gallery covers only a small part of the enclosure. The construction of the Moorish part of the complex was started in the 10th century, and continued till the 13th century. During the 12th century, the Almohades caliphate built the parts that are shown in the gallery above. I lost myself in the intricate work in stone and wood, and the interplay of wind and water for cooling. Along with the calligraphy that you see in the photos, these are characteristic of the Mudejar architecture of this part of the world. Walking in the back streets of Madrid’s art district, between small galleries and run-down buildings, I was stunned by the graffiti you see in the featured photo. It was painted on a sheet of plastic covering part of construction site. The beautiful skyline, minimally emphasized by the yellow lines, and the lettering were so assured, and at the same time so ephemeral! I was lucky that I walked by the few days of its lifetime. I did not see more by this artist. In that sense none of the Spanish cities I visited seemed to have the prolific street artists of Porto. But what I saw captured me. Just as I captured some of what I saw. Here’s the gallery below, browse it and see if you like it as much as I did. On a hot afternoon The Family and I found ourselves near the Atocha train station in Madrid and thought we would go and sit in the Buen Retiro park. The road took us past a line of wooden stalls with books. We walked along slowly, looking at the titles. Most of them were in Spanish, as we’d expected, but there were a few French, English and German titles as well. The quiet street with these charming wooden stalls, a few people browsing, all reminded me of a vanished time when in Paris along the Seine you could actually browse for used books. Like the stalls of Paris, these also stock a few old postcards and period posters. However, the focus is on books. I found later that the stalls have been here since 1925, apparently through the Civil War. At the end of the street was a statue of Pio Baroja, the famous Spanish novelist of the early 20th century, who is said to have been a great influence on Ernest Hemingway. We walked slowly up the slope, crossed the road and entered the park. The heat was oppressive. We sat in the shade of the trees for a while, and realized why the siesta is still a good idea in Spain. Instead of walking further into the park, we left and took a taxi to our hotel for a real siesta. I haven’t written about shopping before. But when you see a shop window in the evening which looks like the featured photo, perhaps I could do it. We walked into the shop to look, and it was full of things which were as wacky as these. Apparently Art Escudellers of Barcelona supports contemporary sculpture and ceramics from across Spain. Apart from the figures which are meant to stand in your home and brighten it we also found things which are useful, beautiful, and equally costly. We didn’t have time to go to the Museu de Ceramica, so it was pleasant to walk into a cool shop to spend a little time just looking at the samples of Catalan ceramics on display here. If we had to buy ceramics we would have spent some time researching the shops. There’s a clutch of very famous 17th century Dutch painters whose paintings we usually take to define the style. You can walk through a gallery of paintings from this period pausing only at the Rembrandts and Vermeers and Hals. But this time and place also produced a set of very skilled still-life painters. Walking through the galleries in the Thyssen-Bornemisza Museum in Madrid, I was reminded of this. 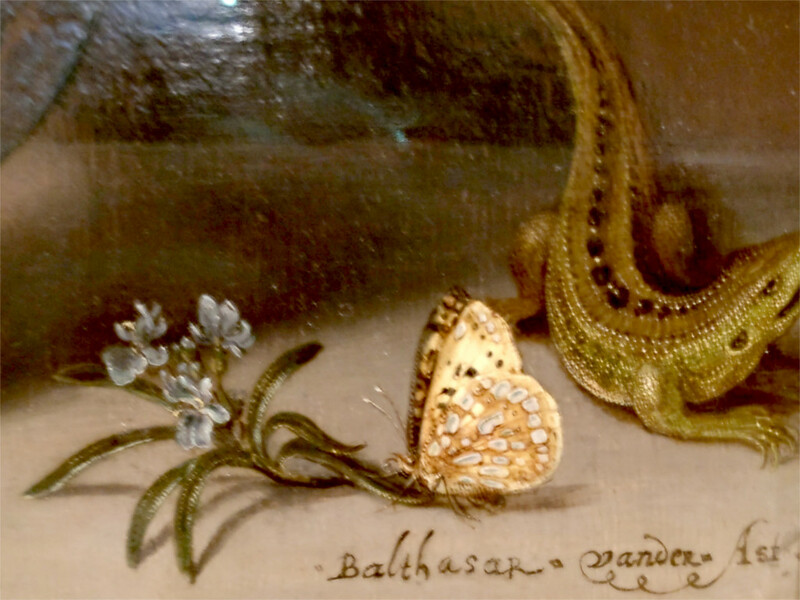 The names Ambrosius Bosschaert or Balthasar van der Ast were not familiar to me, but when I stopped in front of their canvases (detail from van der Ast’s just below, from Bosschaert’s in the featured photo and the last one in this post) I was immediately drawn into their world. The Thyssen-Bornemisza is one of Madrid’s Golden Triangle, the others being The Prado and the Reina Sofia Museum. 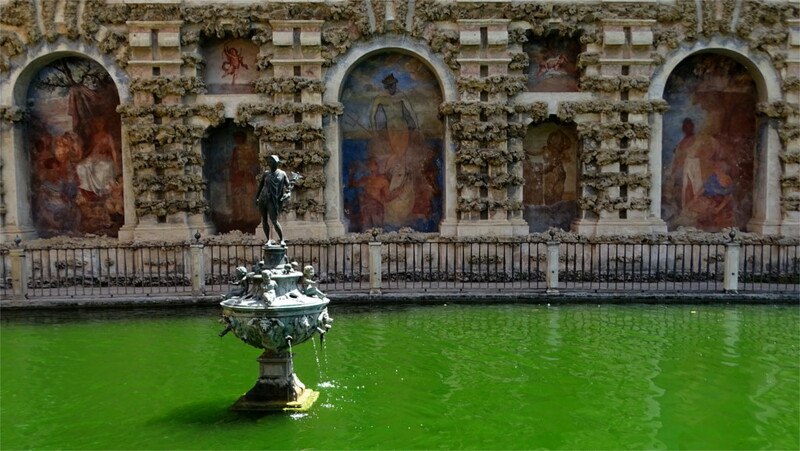 This was the private collection of the Baron Thyssen-Bornemisza, who started by buying up the collections of American millionaires who had fallen on hard times during the Great Depression. I decided to spend half a day in this museum because it was extremely hot outside, and I had half a day between checking out of my hotel and catching my flight back home. 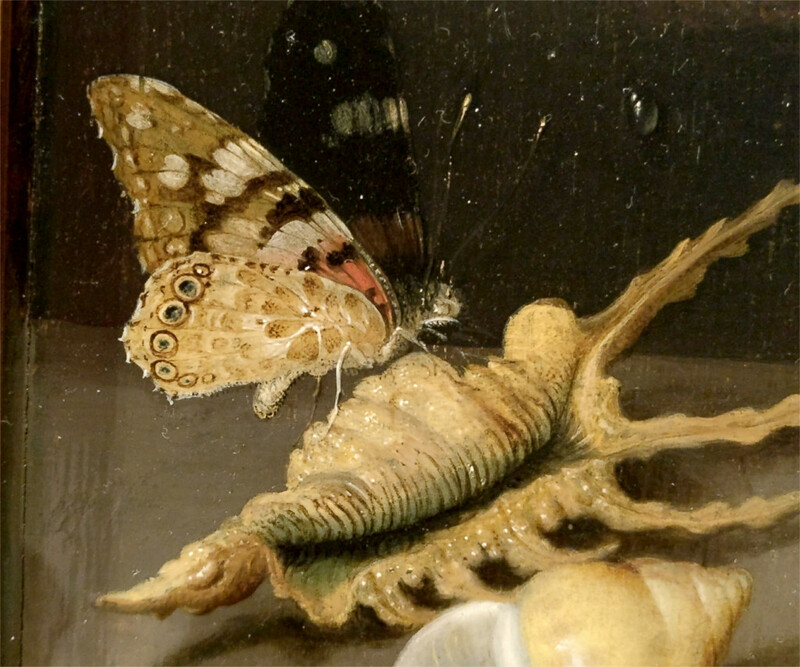 With these three examples of the many butterflies I followed in this part of the collection, I thought I’d managed to spend one of the hours in this museum quite fruitfully. In slow stages I moved on to the abstractions of the early 20th century. This museum is the missing link between the collections of the Prado and the Reina Sofia, so it was an afternoon well spent.